On east side of Dickens Pond Road. From the Hancock County Courthouse, go north on Hwy 15/16/22 for 0.7 mile to where the highways split. Take Hwy 16 on left. Follow Hwy 16 for 6.1 miles to Hunts Chapel Road. Turn left and go for 0.7 mile to stop sign. Turn right on Dickens Pond Road and go for 3.5 miles. 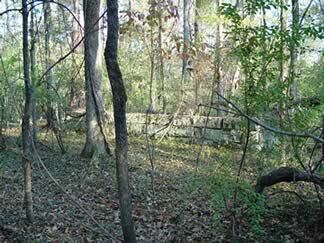 Cemetery is back in woods about 300 feet off the left side of road. Walled area approximately 14 by 29 feet made out of stone blocks. No monuments. 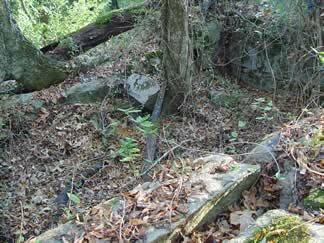 However, there are rocks positioned that could be marking several graves. Also other graves could be around the walled area. According to Lee Dickens, whose family acquired the property about 1923, the property is called the "Ross Place" after the family that owned the property for many years prior to 1923. Therefore, the cemetery may be the Ross family cemetery, but it could have been the owners prior to the Ross family who are buried here. The Ross family may be buried here or it may be the owners prior to the Ross' ownership of the property.